Be the first to share your favorite memory, photo or story of Thomas. This memorial page is dedicated for family, friends and future generations to celebrate the life of their loved one. Thomas Francis Slader, age 79, passed away peacefully March 2, 2019 at the Brigham and Women’s Faulkner Hospital in Boston. He was the son of the late Wilfred and Mildred (Evans) Slader. Tom was born on February 26, 1940 in Queens, NY. He proudly served his country in the US Air Force servicing the KC 97 refueling aircraft. He was an Ossining New York Police Officer and employed for many years as a court security officer in the Federal Court House in Cleveland, OH. He married his wife Kathleen (Rogalski) on December 16, 1961 at the Michigan Selfridge Air Force Base in Mt Clemons, Michigan. 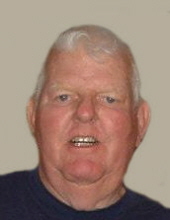 Tom was an avid golfer and enjoyed trapshooting and playing Bingo. He also enjoyed oil painting and thrift store shopping. He was a loving and devoted husband, father and grandfather. He most enjoyed spending time with his family. Devoted husband of Kathleen Helen (Rogalski) Slader. Loving father of Beverley and her husband Tom Crocker of Foxborough, Bill and his wife Sharon Slader of Johnstown, OH and Brian and his wife Charlotte Slader of Bellbrook, OH. Beloved grandfather of Christopher and Emily, Roger and Samantha, Molly, Claire, Stephanie, Gracie, Charlton and Hayden. Relatives and friends are kindly invited to attend a memorial service on Monday, April 15 at 2 PM at the Roberts and Sons Funeral Home, 30 South Street, Foxborough. For additional information please contact 508 543-5471. To send an on-line condolence please visit the funeral home web site at www.robertsandsonsfuneralhome.com. "Email Address" would like to share the life celebration of Thomas Slader. Click on the "link" to go to share a favorite memory or leave a condolence message for the family.